June 8, 2018 June 8, 2018 by Beau H.
We’ve had quite a lot going on around The Style Guide as of late, from a recent trip to Detroit (Editor’s note: Check out my amazing girlfriend Laura’s guide to things to do in Detroit!) to quite a few neat #menswear events here in NYC — one of which you’ll learn about below! Along the way, I’ve carved out some to listen to some new tunes — the new CHVRCHES album “Love is Dead” has been on heavy rotation — and I’ve tried some tasty new beer to kick off summer. On that note, Corona Premier is a pleasingly light, easy-to-drink beer that still harnesses some nice flavor (thanks to the brand for sending over some test brews!). While I love a hefty New England or West Coast IPA — of which you can find a good deal of in Brooklyn — I’ve still got a soft spot for a Corona and a day spent catching some sun. But, back to business. Let’s talk about the watch you need for summer adventures. Or conversely, the classic white tee to wear with everything this season. Or perhaps, a stylish short-sleeve shirt is more your speed this weekend. Whatever tickles your fancy, hopefully, we can help you find it. On that note, we’re looking into a few handy, helpful seasonal style matters today, a new outerwear brand and classic pocket tees among them. So for now, I’ll say farewell. Happy reading, happy shopping … oh, and cheers! Have you heard of or used Stitch Fix? I was able to give this personal styling service a try last fall via my Instagram and blog, but at any rate, GQ.com took a closer look at the inner workings of this fast-moving platform recently. You decide whether the service is for you, I’d say. I had the chance last week to check out the launch of North & Mark, a highly functional, highly stylish outerwear brand that makes its gear in NYC and draws inspiration from the Windy City. From four-way stretch blazers — tailored but easy to wear over a classic white tee to the office — to clean and classic overcoats and a heck of a stylish belted trench coat, this is one brand that’s certainly going to help you up your outerwear game when the weather calls for it. Esquire.com has been tracking the best songs of 2018 (so far), and I’m having a tough time picking my favorite from this list. For this self-proclaimed Indie Rock Dad (Editor’s note: Actually not a father! ), it just might be “What a Time to be Alive” by revered North Carolina rockers Superchunk. What’s your pick from that list? Perhaps most helpfully for y’all, I wrote up some of the best men’s pocket tees for GearMoose.com. My favorite from this list? The Taylor Stitch Heavy Bag Tee, naturally. That’s going to do it for today’s Friday Read. Still need something to read or something to shop? Start with my list of the best summer style essentials. Then, read why you need this timeless navy polo in your closet for summer. All set? All set. April 13, 2018 April 10, 2018 by Beau H.
The only thing standing between you and the weekend is today’s edition of the Friday Read. Well, not quite. Perhaps you’ve got a day on the old job ahead of you as power right on through into mid-April. If you missed the happenings this week at everyone’s favorite menswear blog (The Style Guide, of course), then we’re here to fill you in. We talked the best way to wear chukka boots this spring, and we also talked about one of the best pairs of spring chinos to buy now. So, there was certainly a lot going on in terms of style this week. Elsewhere in Brooklyn and beyond, I’m way excited to welcome my amazing girlfriend Laura to the borough and to the Big Apple for the very first time! While we’re here, she’s a marvelous photographer (and a wonderful human! ), and you’d do well to check out her photography work. We’ve got lots on the docket, including exploring Prospect Park and Central Park, plus grabbing a classic NYC brunch and record shopping at the legendary Rough Trade in Brooklyn. And of course, it’ll be business as usual here on the blog, complete with tomorrow’s Style Pick of the Week. For now, I’ll leave you to start your weekend with these choice reads. Thanks for supporting The Style Guide, and we’ll catch you on the flip! I’m all about experiential vacations that go beyond the ordinary. Such is the case with a new chance to stay in the old, famed Pabst Blue Ribbon brewery in the beer-friendly town of Milwaukee. That sounds like a trip I can get behind — my pals at The Manual have the full scoop. Who can resist an affordable, stylish watch? The great folks at Esquire.com have done their best to round up the best affordable watches for men, so give that a read before you make your next timepiece purchase. For my money, I think this affordable Timex watch as covered here on the blog might be your best bet for casual weekend style this season. Looking for an easy way to give your spring weekend style a shot in the arm? Just add a simple, easygoing and yet versatile layer like the Grayers Dalton Terry Crew (last week’s Style Pick of the Week entry). It really gets no better, folks. Wear it with light wash denim, white canvas sneakers and a slub T-shirt for off-duty style that just gets a lot of things right. Lastly, let’s talk one more dose of shopping today. Are you in need of new high-top sneakers for spring? Of course you are. My latest post for The Manual covers that topic precisely. Not a bad read, if I do say so myself! That’s going to do it for today’s Friday Read. Enjoy the weekend and follow along with my adventures on Instagram and Twitter. February 16, 2018 February 15, 2018 by Beau H.
If you can believe it, we had to call an audible when it came to last week’s Friday Read given the hectic pace and scheduling of New York Fashion Week: Men’s. (Runway shows! Collection previews! Afterparties!). But I’m pleased to report that we’re back this week, and better than ever — well, hopefully. Who else is looking forward to the weekend? Was our guide to what to wear on Valentine’s Day this week helpful? You can be sure we’ll have more #OOTD content — and tomorrow’s Style Pick of the Week — on the way very soon. On that note, did you catch last week’s Style Pick of the Week? The Taylor Stitch Winslow Jacket is about as good as it gets when it comes to adventure-ready weekend style. And speaking of weekend adventures… this weekend is an exciting, busy one as well. I’m hitting the road back to Grand Rapids to see childhood friends, enjoy Beer City U.S.A (!) and visit my family (including four nieces and nephews!). It’s going to be a jam-packed, super enjoyable weekend, dovetailing off my trip last February to Grand Rapids (and quickly becoming a tradition for me?). At any rate, you can catch all the action live on Instagram and Instagram Stories (of course). In the meantime, enjoy the weekend — cheers! So, the iconic, much-discussed and much-debated seminal indie album “In the Aeroplane Over the Sea” by Neutral Milk Hotel turned 20 last week; can ya believe it? It might have been just a bit before my time, but it’s an album worth studying & appreciating — as Pitchfork noted in its review upon its reissue some years ago … a perfect 10! What’s your take? The Winter Olympics are here — in the spirit of keeping you in the loop on the festivities, our pals at Esquire.com published the lazy person’s guide to the Winter Olympics; good enough, right? Perhaps you’ve seen this news already, but last week, L.L. Bean announced it was changing its return policy, a famously accommodating one at that; will you be taking more care of your Bean Boots from now on? Lastly, let’s talk what you’re drinking this weekend — the Samuel Adams Sam ’76 brew is my latest write-up over at GearMoose, and you might just want to track it down and raise a glass this weekend. Who’s with me? Hopefully, the above features helped you start your weekend the right way — see you for tomorrow’s Style Pick of the Week! February 2, 2018 January 30, 2018 by Beau H.
We’ve powered through the week and we’re staring down the weekend — that’s a heck of a good feeling, right? We kept busy at The Style Guide this week, serving you up an #OOTD that covers how to wear a crewneck sweater this winter (in a way that even works at the office, if you can believe it!). We also went behind the scenes on my latest men’s style road trip, this time to Florida for a birthday weekend at Disney World — a truly great time was had by all, to say the least! We stopped at countries “around the world” at Epcot, we checked out the wonders of Animal Kingdom and we even spent a jam-packed day at the Wizarding World of Harry Potter — not bad at all, right? I’m now looking forward to a laidback weekend, likely featuring some craft beers at Gold Star Beer Counter, plus some time spent in Prospect Park (and a likely trip to my favorite coffee-and-menswear spot in the city, Upstate Stock). Before we get to that, we’re rounding a day in the office — and helping you do the same — with some choice links for your perusal (and potential listening pleasure). Sound like a plan? Without further ado, let’s get this going. Esquire.com will kick off this edition of the Friday Read for us, namely the lauded (if struggling) retailer’s take on new dress shirts — stock up, maybe? Or maybe not? On a music-related note, this past week was a pretty big one for my favorite band, Ohio-born indie rockers The National — these well-dressed gentlemen took home the Grammy for Best Alternative Album! “Sleep Well Beast” was one of my favorite albums of this past year, and I think it’s a well-deserved accolade. Read more with the band’s Aaron Dessner at the link above. I absolutely love me a great pair of shoes — especially retro-inspired high-tops like the Converse Chuck 70 Wordmark, which I wrote about for GearMoose. Step into ’em, lace up and get ready to step out in style! I don’t know about you, but I found this Esquire.com piece on WeWork — the global “shared-space nerve center,” as Esquire says — to be quite fascinating. What say you? January 5, 2018 December 29, 2017 by Beau H.
Just like that, it’s the very first Friday Read of 2018! It’s tough to believe that we’ve knocked out a proper week in January — how are you holding up? Earlier this week, we talked men’s style resolutions — we also continued our #OOTD series and got ya ready to start the new year in style with another edition of The List (covering the best men’s gear to buy for 2018). If that doesn’t get you fired up to start the new year right, I’m not sure what will. At any rate, it’s been a pretty busy week kicking off my day job in fashion PR, and I’ve also started to churn out some more #menswear entries for GearMoose — you can expect updates on those pieces in the coming weeks & months ahead! And most importantly, I’m looking forward to getting my apartment updated with a few key home goods that Santa gave me this Christmas … including, crucially, a wooden shoe rack that’ll hopefully give me much more space in my humble Brooklyn abode. After that, I intend to get out and explore a bit of Brooklyn (likely while enjoying a few tasty treats along the way). What are your weekend plans? Feel free to connect with me on Twitter any time — let’s get to the rest of today’s post! Ever on the cutting edge of stylish, dependable — and sometimes ridiculous — footwear, Esquire.com serves up this list of the best sneakers of the past year, some of which you’d do well to research and buy now … hopefully at slightly lower 2018 prices? Good luck out there. Holiday travel season might have just ended, but I still think you should seriously consider picking up the Taylor Stitch Travel Pants. Think of the remarkable Travel Pants like an upgraded sweatpant, with a fit that darn near mirrors that of your favorite chinos. Read my latest on this stellar launch for GearMoose! My friends, that’s all the quick reads we’ve got today. Enjoy your weekend, check back for tomorrow’s Style Pick of the Week and thanks for reading! December 1, 2017 December 1, 2017 by Beau H.
Alright, we made it to Friday — raise a glass! Or crack open a cold one and kick back. It’s the welcome end to a long week here in NYC, one that caps off a busy five days of work following my latest Style Guide trip to celebrate a Florida Thanksgiving with my family! It was a long weekend complete with an amazing Thanksgiving meal, plus many helpings of leftovers in the days following. I even got some shopping done for Black Friday — you can check out my Instagram in the coming days for more in that regard. And why should you follow along on Instagram, exactly? Well, I’m heading back down to Florida this weekend to visit my sister for the 97x Next Big Thing music festival in lovely Tampa Bay! I’m excited to hit the road tonight to take in a great, great weekend of live music featuring some seriously fun, seriously powerful bands (many of whom I’ve had the chance to see in and around NYC as of late!). That includes the festival’s two main headliners, The Lumineers and Paramore, along with other highly enjoyable groups like Canadian pop-rockers Arkells, New Jersey’s own Bleachers, the always-fun MisterWives out of NYC, groovy indie rockers Portugal. The Man and upbeat dance rockers Saint Motel! That’s just the tip of the iceberg, though. It promises to be a sunny, fun weekend in Florida — I couldn’t be more excited to once again break out some warm weather style essentials, just as in past road trips to Florida, and it’s certainly a treat to embark on another Style Guide road trip centered around stellar music. Now, I know we can’t all be so fortunate as to head to warm weather every weekend … if you’ll be battling chilly temperatures, I’d recommend a stylish pair of boots like the Nisolo Andres Boots,our most recent Style Pick of the Week here on the blog. 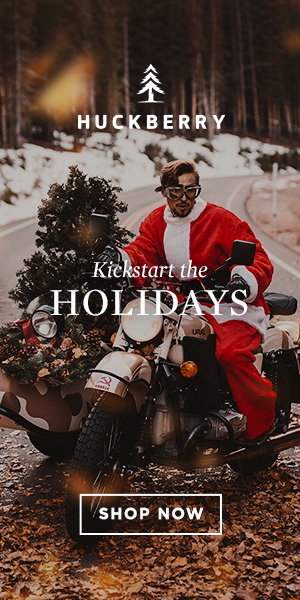 And if holiday shopping is in the cards for you — as it should be — then you’d do well to check out this site’s picks as to the best gifts for men. But more on that very, very shortly. For now, you can join me on Instagram to follow along with all the fun this weekend, and you should stick around tomorrow to check out our next Style Pick of the Week. Alright, now it’s off to catch my flight! OK, folks — have we got a heck of a deal for you. Launching today (that’s December 1st), the good folks at Nisolo — of Andres Boot fame — are offering a men’s holiday gift bundle and an equally stellar women’s holiday gift bundle that you’re not going to want to miss. Now through December 24th, customers (that’d be you!) can spend $35 to get $250 worth of shopping credit at “bundle” brands — in short, we’re talking five brands and five gift cards good for $50 at each brand. What’s in store at each brand? Well, we’ve got rugged outdoor gear from United By Blue, beautiful bags from ONA, high-quality tailoring from Ledbury and stylish men’s boots from Nisolo, among other highlight in the men’s gift bundle. Seriously, what’s not to love about that? Again, you can get the men’s holiday gift bundle and the women’s holiday gift bundle (for yourself or someone else!) through December 24th. Wearing a casual T-shirt this holiday season doesn’t have to be sloppy. Over my Thanksgiving trip to Florida, I found myself reaching for a Barking Irons tee time and again, featuring soft fabric and a retro fit. If that sounds good to you, you might want to pick up the “War Is Over” Tee from Barking Irons, or one of the brand’s other sharp graphic tees. They’d make a great gift for the guy who appreciates standout casual style, too. Let’s talk a bit of grooming today on the blog, and specifically, how to keep your teeth in prime shape during the holiday season. Between red wine, chocolate, craft beer and more, keeping your teeth white can be a tall order. So, I’ve been testing out LusterPremiumWhite and the brand’s PowerWhite Deep Stain Eraser Flouride Toothpaste (courtesy of the brand) these past few weeks, and I truly can’t recommend the brand enough! It even helped me soar through my last dentist appointment with flying colors (well, sort of). Grab a tube now. And with that, I say goodbye until … tomorrow!